Honored to contribute an article to the informative and passionate digital magazine, "CRAFT - by Under My Host" Follow the link below to get to my piece and all of the other "must reads...."
In anticipation of The Publican’s 4th Annual Harvest Dinner, on Tuesday, August 27, our team embarked on our annual farm trip in search of ingredients for the meal. The coursed dinner will feature produce, meat and dairy sourced directly from the farms by Chef Brian Huston. Served from 5:30 pm-10:30 pm, the dinner will highlight the best that Genesis Growers, Rodger Marcotte, Faith's Farm, Iron Creek Farms and Mick Klug Farm have to offer. 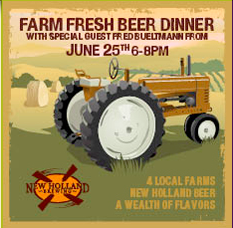 Each locally-sourced course will be paired with New Holland beer and spirits. 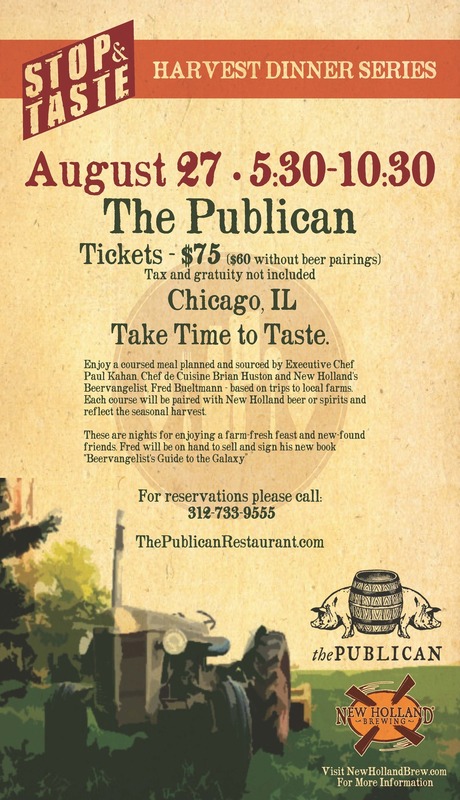 $75 per person with pairings, not including tax or gratuity. $60 per person without pairings, not including tax or gratuity. I was invited to come up to the Traverse City Microbrew and Music Festival to add a beer and food component. WIth the craziness of a busy fest filled with lots of attractions, we knew there would be challenges to a sit-down dinner or educational presentation. When I heard they were creating a small campus of food trucks, featuring the latest development in Traverse City food scene, I came up with an idea, which was guided Beer and Food tours. Last night, I took two different groups of 8-10 people on a walking tour of the food trucks, while pulling a wagon that had growlers of beer on ice from various featured breweries. I selected food items in advance, and chose beers that I thought would pair nicely. We arrived at each food truck, they provided sample sized bites, and we hung out in the Summer air and talked about flavor. The few logistical hurdles were overcome, and overall I felt it went over swimmingly. I enjoyed the pairings, and conversation. Here are last night's pairings, for those of you returning to the fest today. (VIPs at 3 pm, Public at 4 pm) I'm also offering 3 more tours today (Saturday). Come on by the Beervangelist Tent where I have books and New Holland Schwag for sale. I'll likely repeat some pairings and try a few new ones. I also may adjust the times slightly, so come on by to reserve a spot by signing up on the list. They are complimentary (FREE), courtesy of the TCMMF, the CherryT Ball and the Beervangelist. Come by and visit, buy a book or take a tour! 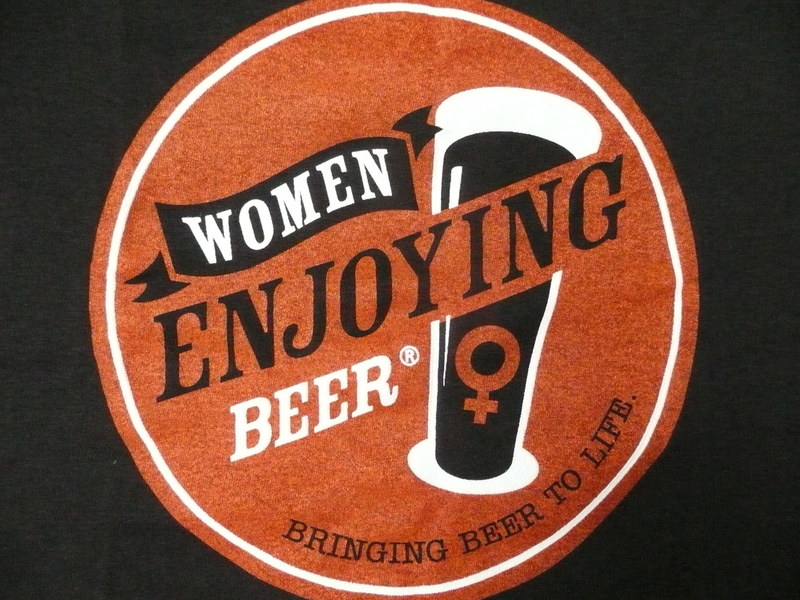 On January 2nd, Ginger Johnson of Women Enjoying Beer interviewed me for her show, Beer Radio on KSKQ Public Radio, Portland Oregon. A friend brought it to my attention recently, and it just dawned on me that I don't think I ever posted the link. It's about an hour, and is a streaming archive from their Public Radio Archive. Ginger ia a generous host, who always gets me riled up and rattling on about various parts of my life in beer. You'll soon know why I claim that she has the best laugh in the world of beer-radio. I espouse on various topics ranging from the Danish food and drink culture & Julfrokost (which i mistakenly compared to a Smorgasbord - GASP), to my own food and drink awakening as well as what was at that time, an ongoing book project. It's definitely a full length interview, with engaging conversation and a pretty good look into why I care about food and drink. Good listening for your kitchen, while you make some summer treats and enjoy a nice cold beer. Thursday is my first release event with the book, and in a slighly odd turn of fate, it's out of town. It has been a surreal project, especially the finishing stages. As the book becomes this physical thing, expressing ideas that I've wanted share for years, there's this big swing between immense pride and gratefulness to vulnerabilty and anxiety. I have scheduled six "Harvest Dinners" this year. I started this format a few years ago with The Publican. We visited farms and wrote the menu for the dinner the following week, during and immediately after our visits. We talked with farmers, tasted vegetables and had a nice lunch together, finding ourselves truly in the moment and inspired to take that feeling and the stories of the farms, and express them on the table with our food and beer. This year, the series of six begins with Food Dance in Kalamazoo. Julie Stanley and Executive Chef, Robb Hammond were a significant influence on me, even before I appreciated or understood seasonal eating. Their restaurant, once a quaint breakfast spot, has led the way in supporting farms, teaching people to eat better and making it fun along the way. What's funny, is that I had no idea I had put the schedule together like this. The day before I put myself on a plane, to share my treatise on seasonal eating and drinking with the big scary world of New York City, I'll have a day in the saddle with mentors, friends and farmers, including the first restaurant to make me stop and think. Serendipity or something like that. Consider me grateful. We'll go out and see everything that June 12th, 2013 in West Michigan has to offer, and even speculate a little bit towards June 25th, which is when food hits plates. I could really use a little dirt beneath my boots and an afternoon of Robb's sardonic wit, and Michelle's bright spirit. We're visiting Scobey Farm, Deleo, Blue Dog Farm and Carlson's Farm before heading in to sketch out the menu and pairings. I'll report back, and include some delicious photos from the immeasuarable, Jeff Hage of Green Frog Photo. Lastly - welcome to my new website and blog. Please pardon the construction and state of affairs, we'll have it whipped into shape in no time. Following is an essay from Beervangelist's Guide to the Galaxy, that includes some good friends and my take on "Harvest"
I had a pretty casual relationship with locally grown produce for a long time. I would nod in appreciation if a friend brought something from their garden, but I didn’t think to arrange my eating around what was coming up or growing. I can recall a friend giving me a jar or two of “Grandma’s pears,” a sweet gift that didn’t seem all that significant,because it wasn’t filling a need. In fact, we’d have to find a way to make an occasion for them, so we didn’t forget them in the pantry. The grocery store had groceries; this roadside stuff just seemed like people’s tasty little hobbies. The significance of not seeing the raising of food as a need points to our, or at least my own, disconnection, an occurrence I think is quite common today. I began to value restaurants and chefs with a local or seasonal bent to them, simply because they were putting out the best food. As I ate their food, I was inspired by their cooking and also began to understand that they had a deeper philosophy behind how they wrote their menus. The fact that certain dishes might be on their menu for a matter of days or weeks, and then no longer available, seemed like a clever idea at first, a way to keep things interesting, rather than a sourcing reality. I smiled at Food Dance’s decision not to use tomatoes on their burgers unless they were in season, not fully grasping the stand they were making against imported, modified, and therefore inferior tomatoes. People thought they were being dramatic, but later I realized they were refusing to put them on plates because they couldn’t stand behind them. Over time, it became more clear to me. If you had a tomato at Food Dance, it was going to be delicious, because nothing less was tolerated. By the time our neighbors joined us in putting in a relatively sizable garden, we were all pretty hip to the concept. We wanted to grow food for our kitchens. We’d eat what we could keep fresh and “put up” whatever was left for the Winter. As certain vegetables came on strong, we’d dig into the books and figure out the best way to store them. I made every zucchini dish I could muster that first season, as our plants were prolific. We froze, pickled, and canned, depending on what the book told us we should do, or what we remembered our grandmas did. It was a fun project, but several moments sank in over the course of that first year and really shed light on our overall relationship with food overall. I was responsible for “processing,” and there were moments when we watched the brightness of beautiful produce fade and then disappear because it wasn’t processed in time. There was a sense of sadness or solemnness connected to that waste, although it varied based on how robustly or sparingly something grew. Neighbors Matt and Amy had suggested that we would love using canned tomatoes all Winter long. “They’re great to add into sauces and all sorts of things.” I wouldn’t call myself skeptical, but I wondered about it, because I hadn’t found myself using many canned tomatoes up until then, unless a specific recipe like barbecue sauce or maybe a redsauce called for it. As Winter rolled in, the opportunity to walk down to our freezer or canning shelves while we were buried during a snowstorm and eat the food that had grown ten yards away was remarkable. I’m sure it was part conceptual novelty and part nutritional fortitude, but making a dish with our home-canned tomatoes seemed so revolutionary. It was nothing short of an epiphany. Things changed. It started slowly at first but, little by little, these jars of Summer were making it into all sorts of dishes, like chili, pot roast, collard greens, and improvised pastas. By the end of the Winter, I was eyeballing our shelf of tomatoes, gauging how I would have to ration them out to make it to next season. Sure, I could find more tomatoes somewhere, but these represented a slice of last season that literally could not be replaced, because no more of these particular tomatoes existed. Collards were another lightening rod for me. We grew several cooking greens: collards, kale, Swiss chard, and mibuna something-or-other. I enjoyed them all, but collards really hit the sweet spot. I like them at dinner as a side, as an accent in soups, stews, and pastas, and as a base alongside our tomatoes in my favorite farm breakfast, “Eggs in a Nest” (thanks to Barbara Kingsolver’s, “Animal, Vegetable, Miracle”). We had a ton of greens, and we made a processing assembly line out on our back patio. We brought them in from the garden in big laundry baskets. We trimmed the collards, chopped ‘em, and blanched ‘em in boiling water in an outdoor turkey fryer. After a couple of minutes in the water, we drained them onto big beach towels and rolled them up to squeeze out remaining water. We put them in Ziploc vacuum bags, then pumped the air out with one of those things that look like a mini bike pump. It took all of an afternoon, and I think we did it twice that season. The massiveness of those heaping laundry baskets shrank incredibly to twenty or so quart-sized bags of collards by the time we were done. We divided them up and threw them in the freezer. The joy I felt pulling those out of the freezer and making hearty, healthy food in January is frankly hard to put into words. I did not realize I could get so excited about an ingredient, especially a vegetable. What’s interesting is that without even knowing it, my cooking and eating patterns were shifting. I was imagining those ingredients and then creating dishes around them. Gone were the days of thinking dish first and then hunting for ingredients, no matter what month it was. Gone were the days of trying to figure out how to use something up, or hide it in something. I was genuinely inspired by the wholesome goodness of these ingredients that we had figured out how to make last well beyond their season. It’s important to remember that you’re not necessarily keeping the food in the same state as its fresh version. I find I cook with tomatoes in the Winter and eat sliced tomatoes when they’re in season. Freshly picked raspberries and blueberries are incredible and transcendent. Their texture and springiness are different after the freezer, but their flavor remains intensely regional. I’m more likely to cook them or otherwise process them after the freezer, whereas I like to eat them raw and untouched in their fresh state. Adapting and building dishes around these flavorful frozen gems is much more rewarding to me, however, than eating the fresh versions that have been shipped across the continent and are available year-round in the store. I find it ironic that the off-season is what really connected me to the seasons. It was “putting up food” that connected me to the role we play in creatively expanding our opportunities to eat superior ingredients. I could see throughout the Winter that this was not a hobby, that this was about sustenance. I felt connected to history, and imagined how important this was to the generations before us who were known for these skills. Our grandmothers and their grandmothers weren’t putting putting up food because it was cute or en vogue. They were storing food to feed their families. I pulled in, and after a half hour of small talk, I left with a half bushel. Another charming example of the social shopping experience. I went home and ate a couple, while wondering what the hell I was going to do with this many plums. After a little thought, I decided on a barbecue sauce made with our smoked rye dopplebock, Charkoota Rye. I had a whole-hog beer dinner on the horizon, and it would make a lovely addition. I went to work, digging into the canning books, and made a sauce that combined a traditional sauce and a plum chutney, as well as some of my own barbecue tricks. I canned them according to the guidebook and was delighted with the result. I caught him late season, but when I got into the kitchen, I struggled to get the sauce right. I tweaked and tweaked, adding acid and really working to get the plum character I wanted. It took me a while to figure it out, but I deducted that late-season plums are great to eat fresh, but early season plums are brighter and less sweet, and just better for the sauce I like to make. I share this story because I learned that the art of putting up food allows me to capture that particular week in a plum’s life in all of its glory. Even though I liked the first year’s sauce better, I found myself grinning with this newfound knowledge and appreciation. how the plum story takes us to the next point. You don’t have to be a gardener to connect and capture the season’s flavor and nutrition. The thrust of our garden’s output pushed me into my own personal discovery, but what I love is taking that knowledge and applying it to the farmers market, or other situations like my neighbor’s momentary plum stand. Honestly, we have trouble keeping up with a garden. It’s a ton of work, and we have busy lives. With canning and freezing on your side, though, you can leave the weeding to the professionals and capture the peak produce moments by buying the things you want to put up in bulk and going to work. What’s more, you even get a little scheduling flexibility. You’ll have a few weeks or more to choose from, depending on the ingredient, so you can buy it on a week you have time to put it up, whereas a garden has no mercy or appreciation for your busy schedule. Buying in bulk makes you a slightly different customer at the farmers markets and stands, too. If you’re going to can the tomatoes, for instance, you don’t need the pretty ones that are all “graded” for market. Taking a lesson from several of my bulk food mentors, I learned to ask for “splits” or “seconds” on the days that I’m buying to put them up. If they have ‘em, they’ll sell you bushels full of produce that is blemished in some way, typically at a much lower price. It’s still totally delicious for the canning cellar or freezer, so you’re now preventing waste, spending less, and stocking up your cellar to keep your kitchen in local produce year round. Pretty cool stuff. This responsibility also seems to tie me into the seasonal rhythm. There are weeks of happy-go-lucky, fresh food shopping and eating, but others where my Spidey Sense starts tingling and I recognize that the end is near for one ingredient or another; if I want it beyond its season, the time to store it is now. This could all seem like more hassle than you need. I mean, isn’t this what the grocery store is for? To some degree, that’s true, and I’ll tell you, our house is certainly not sustained completely by our own food storage. However, if you start with one or two things, ingredients you love and see a difference between the grocery store version and your locally found treasure, it will all start to come clear. We make plenty of exceptions, and I’m grateful for quality grocery stores that keep us from being totally dependent on our cellars, but I have found the art of putting up food to be eye-opening and fulfilling in more ways than I can describe.